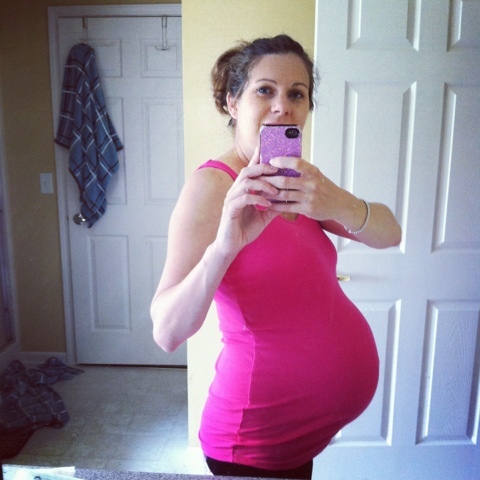 I am 34 weeks pregnant today. Only 6 more to go, well 3 more to full term. The baby's room is coming along. I will take some pictures and post later. I have almost all of his clothes washed and I picked out his going home outfits. I am going to pack 2, 3 month outfits and 2, newborn outfits because I am not sure which one he will fit into and I am undecided as to which he should wear. I am up 40 pounds! I feel so big and am pretty sore most days. I have been walking a lot during the day. Evelyn and I took a 3 mile walk today to the park and back. I am trying to stay active and hopefully that will help with a fast and somewhat easy labor.